Hriday Sarma, India Fellow at Polar Research and Policy Initiative (PRPI), recently had the opportunity to speak to Dr M Ravichandran, Director of the National Centre for Antarctic and Ocean Research (NCAOR), an Earth System Science Organisation under the Ministry of Earth Sciences (MoES) India. In the interview, Dr Ravichandran discusses various aspects of India’s involvement with polar matters, ranging from India’s commitments in working towards mitigating global climate change to its conduct of peaceful scientific exploration of the Antarctic alongside other nations. The interview serves as a follow-on to the 10th ‘SDGs in the Arctic’ High-Level Dialogue that PRPI organised at Jawaharlal Nehru University (JNU) in New Delhi in June 2018, in which embassy officials from the Arctic states, senior experts from Indian think-tanks and research institutions, local media and NGOs representatives participated. Could you offer us some insights into the role and responsibilities of your organisation – the National Centre for Antarctic and Ocean Research (NCAOR)? We know that NCOAR is designated as the nodal agency for planning, coordination and implementation of India’s Antarctic Programme. So, what are the various activities that it conducts under its purview? NCAOR was dedicated to the nation (India) on 5 April 2000, with a mandate on Antarctic research, i.e., a nodal agency for planning, coordination and implementation of India’s Antarctic Programme (initially, from 1998, it operated as Antarctic Study Centre under the Department of Ocean Development). However, over the last 18 years, the research endeavours of our Centre cover scientific programmes which are truly trans-hemispheric, cutting across from north to south. While it has two established year-round operational research bases in Antarctica (Maitri and Bharati, 3000 km apart), India has also set foot in the Arctic with its own research base Himadri in Ny-Ålesund, Svalbard. The Centre also has a mandate to study the oceans and is, therefore, the launchpad for Southern Ocean Expeditions and Integrated Ocean Discovery Programme (IODP), and has recently added the Himalayan Expeditions. We have recently established a research base Himansh in the Spiti Valley, Himalayas. In addition, NCAOR has been mandated by our nodal Ministry of Earth Sciences into mapping the Exclusive Economic Zone, evaluation of its resources, and the mapping and knowledge on the hydrothermal vents near the triple junction in the southwest Indian Ocean. Is there any ongoing activity, whether at the national or global level, that you or your organisation is involved with that you feel deserves a special mention? The Antarctic, Arctic, Southern Ocean and the IODP programmes are equally important, with each programme contributing to understanding the past and present processes of the Earth Systems. Majority of the programmes at NCAOR converge on a single point focus, i.e., climate change at different time scales. Efforts are on to understand the processes that are instrumental in how the Earth’s climate has changed over the past and how it is changing in the modern age. Expeditions are launched every year to understand the inter-annual variation in the weather systems and how this knowledge can be utilised in predicting the future climate systems through modelling studies. Our scientists collaborate with various national and international research institutes to decipher a larger picture, i.e., climate change. As we understand today, the global climate being such a dynamic system, it is imperative to look at many regions rather than concentrate on a single point. A collective effort through national and international effort will help us to understand climate variation in a better way and will definitely help us to take careful steps to sustain the future of mankind. Do you agree that the Himalaya-Hindu Kush mountain ranges and the Tibetan Plateau constitute the Third Pole on the earth, other than the Arctic and the Antarctic? Noted scholars, like Dr. Falk Huettmann (University of Alaska Fairbanks) and Dr. Ashok Kumar Roy (University of Alaska Fairbanks), have claimed there exists close links between the three earth structures. What is your take on this issue, and does it also coincide with the Government of India’s stance on this? Well, scientifically, all major mountain ranges, such as the Himalayas, the Alps and the Andes, are considered as the Third Pole on the earth due to their close similarities with the conditions that exist in the Arctic and the Antarctic, despite the differences in altitude. These mountain ranges do play an important role in the global climate system and are responsible for modulating the local regional climate. Of course, major studies pertaining to the past climate and the present weather system models have shown close relationships with the north-south poles and the third poles. The major climate systems are linked through teleconnections which are now better understood. These teleconnections are the pathways through which the signals are being propagated from one weather system to another, connecting the northern and the southern hemisphere systems. Past climate studies reconstructed from marine sediment cores and ice cores have clearly established these links through both atmosphere (on a shorter time scale) and the oceans (on a longer time scale). For example, it is very well documented how the ENSO system interacts with the Indian Monsoons and affects the amount of rainfall that the Indian Subcontinent receives. Since time immemorial, it has been understood how important the monsoon is for the Indian Subcontinent. The Indian government has major funding that is allocated to research institutes that work to understand and predict the Indian monsoon through the past to the present. Institutes like the Indian Meteorological Division, Indian Institute of Tropical Meteorology, the Indian National Centre for Ocean Information Services and many universities have majority of their research dedicated towards understanding the complexities of the Indian monsoons. A population of more than a billion is directly dependent on the monsoons, and it is imperative that we focus on it. A better prediction model will help the government advise its agro community and a host of other communities that depends on the monsoon system. Past climate studies have shown how the monsoon intricately communicates with the major climate systems, such as Arctic and Antarctic, as well as Northern Atlantic Oscillation and El Niño-Southern Oscillation. The Government of India understands the importance of the monsoon variability, and how it can change the whole dynamics of the Indian Subcontinent. A weakened monsoon will lead to drought in some places, while a stronger monsoon might lead to a flood situation. To be prepared is the best way forward and the scientific community is just about doing the same. What do you think are India’s latest achievements when it comes to its participation in polar matters? Has India been able to prove itself a real stakeholder actor, party to protecting the climate and ecosystem of the Arctic and the Antarctic, while also continuing with its scientific exploration and research activities? Though India is still categorised as a Third World country, it is second to none when it comes to its contribution to the scientific contribution to the Polar Regions. From launching its first expedition to the Antarctic in 1981 and becoming a full-time member of the Antarctic Treaty, it has progressed in a very significant way in terms of scientific research and logistics input. It has two year-round research bases in Antarctica – Maitri (1989) and Bharati (2012), with the latter being categorised among the top five best research bases in Antarctica. Over 70 research institutes and universities are contributing to the understanding of the Antarctic in all the three spheres, viz., cryosphere, lithosphere and hydrosphere. The research output focuses on both the past-climate and modern-climate variability. Antarctica and the Arctic being the first responders to climate change, it is here that the scientists are looking for the subtle changes that are being mitigated by the human influence on global climate. India, being a party to the Antarctic Treaty, strictly adheres to the norms that have been laid by the Antarctic Treaty Consultative Meeting committee (ATCM). Every year, a team of international observers visits the stations and reports back to the ATCM. 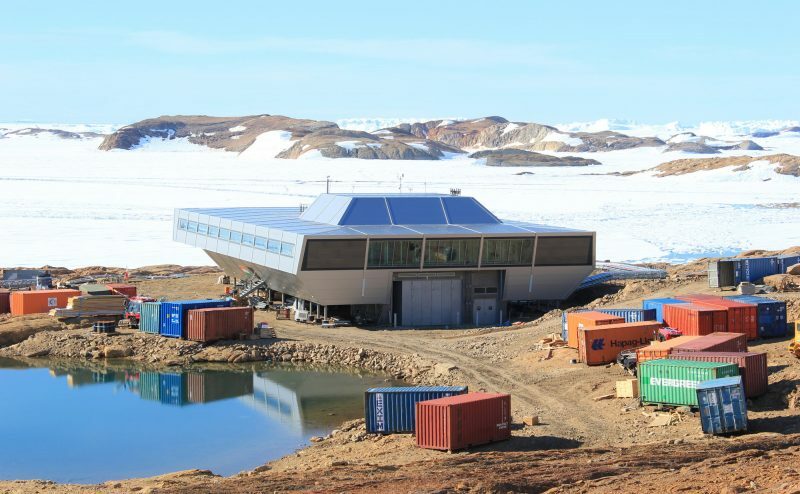 The ATCM is held every year to monitor the progress of each of the station’s presence in Antarctica and to ponder over the impending challenges and the pathways to overcome them. An Environmental Protocol-designated officer for each country needs to submit the reports on the footprints that each country leaves in Antarctica. The process to monitor the stations is quite rigorous in order to keep the footprint to a bare minimum. To keep the carbon footprint low, the efficiency of the instruments and vehicle are monitored, maintained and overhauled every year. Advance technology is being used through infrastructure development, and its efficiency leads to lower carbon footprint. The air-water-soil quality is being monitored on a continuous basis and is reported to ATCM. Antarctica, being one of the pristine regions in the world, utmost care is taken to keep the human footprint to a minimum. India has established three research bases in Antarctica over the last three decades and one research base in the Arctic in the last decade. A permanent research base provides impetus to carry our scientific research activity at par with international researchers. Collaborative projects are being launched at national and international level to develop multi-disciplinary research objectives. State-of-the-art instruments and lab facilities are being developed both in Antarctica and the mainland to obtain reliable data. BP’s Statistical Reviews of World Energy, in recent years, has claimed that India has had among the world’s largest national increments in carbon emissions. This essentially mean that India is treading an energy-intensive development trajectory that will have climatic repercussion within its boundaries and at a system-level. Taking this into account, do you think India should come up with a unified policy framework to address the wider implications of its domestic carbon emission activities? India is ranked third in energy consumption, with China leading, followed by the USA. However, if we consider the per capita energy consumption, India doesn’t feature in the top 20. Setting aside these statistics, I would like to opine that unlike the “First World” countries, India is a growing economy, and it needs energy to cater to its huge populace, similar to China. On the same lines of increasing energy consumption, India is also looking at alternative energy sources such as solar energy and wind energy. India is also drastically changing its energy policies in all sectors to reduce the use of non-renewable sources and move slowly towards renewable sources. Given the populace, no doubt it is a humongous task but the efforts are already underway to tackle these growing emission problems. As a country, the use of firewood is fast being replaced by the more combustible and less polluting LPG. This itself is a great achievement if you consider the regional complexities of the nation. India is also a party to the Paris Agreement of 12 December 2015 in which almost 180 countries have pledged to bring down emissions starting from 2020. No doubt it is a humongous task but as a developing country, it is very evident that India is making strides in using advanced technology and shifting to alternate energy sources so as to honour the Paris Agreement. I am sure that we will be successful in achieving the objectives that we have set for ourselves as a nation. What, according to you, are the main challenges and opportunities shrouding the Arctic and the Antarctic at present? How do you think humanity should work towards efficiently addressing these challenges, while also reaping optimal benefits that are coming from newfound opportunities? Recent studies, compared with long-term studies, have shown that Arctic ice is dwindling and very soon there won’t be any summer multi-year ice in the North Pole. Arctic sea ice decline triggers Arctic amplification. This amplification will cause a decrease in the North-South temperature in the atmosphere, resulting in a slowdown of polar jet stream and eventually cause more extreme weather, especially changing monsoon patterns. Similarly, significant melting of ice is being observed in the southernmost continent i.e., the Antarctica, more pronounced in the Western Antarctic. The signs of warming in the Antarctic are less compared to the Arctic but significant nonetheless. Even though many nations are far away from the poles, it cannot be taken for granted that the changes in both the poles won’t affect the tropical nations. On the contrary, we should start contributing significantly in reducing the carbon footprint by shifting to alternate energy sources. We should look for sustainable technologies to produce food grains bearing in mind that over 60% of India is dependent on an agrarian economy. For example, Singapore has brought out a new law restricting its citizens from buying new cars. The country has attained its saturation point. Cape Town almost ran out of drinking water. There has been unprecedented forest fire in European nations and Australia. These are the cues that we as a nation should understand and foresee where we are heading. A sustainable scientific innovative approach is the way forward to take a nation without leading a nation into tipping points. The solution for every problem doesn’t always present itself in the same place. Rising sea-level due to melting ice in the poles is a very futuristic as well as a realistic problem. The solution for this lies down south, about 10,000 km south in Antarctica. We look for certain solutions there in Antarctica. As I said earlier, it is the first respondent to climate change which is imminent. We have to use the advancement in science to regulate and prepare for the drastic change in climate. As a mandated research institute to work in different realms of the globe, we, at NCAOR, are putting our best efforts from both the poles of the globe and the third pole. To mitigate global challenges, more and more collaboration is imperative among the countries since no single nation can solve such a problem in isolation. Towards this endeavour, for instance, India and Norway are partnered to understand floating ice shelves and adjacent grounded ice (MADICE program) in Antarctica. Hriday Ch Sarma serves as Fellow (India and the Polar Regions) at Polar Research and Policy Initiative. He is also a Visiting Research Fellow with the Institute for Defence Studies and Analyses, New Delhi. Hriday is currently pursuing his PhD in Energy Studies at Jawaharlal Nehru University, India. He holds an MA and MPhil in International Relations, and completed advanced diploma courses in international law and environment management.